Proactively taking responsibility for social issues is a part of our corporate identity and culture. We are absolutely convinced that fairness, environmental awareness and social responsibility go hand in hand with our corporate success. We have been honoured with an award by the Fair Wear Foundation for our commitment to social, safe and fair working conditions for our suppliers worldwide. In the Brand Performance Check 2017 from FWF, we achieved leader status once again, which is the best possible grade. Our Social Report gives detailed insights into our sustainability strategy and provides increased transparency. We outline how our products are made and show how we, as a brand, assume social responsibility when working with our suppliers. Choose an area and learn the goals and actions that we pursue. Anyone who enjoys spending time outdoors in all types of weather like us gets to know nature in a special way and learns to value it. We are committed to protecting the environment, both on our doorstep and where our products are manufactured. We report on our far-reaching initiatives here. Fair and humane working conditions are an important topic for us, whether we are talking about Jack Wolfskin employees in Idstein, Neu-Wulmstorf or our stores, or whether we are referring to manufacturers and their employees in our global supply chain. We treat everyone with respect and consideration. You will find up-to-date information about our social commitment in Germany and at our manufacturers worldwide here. All the materials that we use for our products are selected from an ethical point of view and produced as sustainably as possible. We show which criteria we use to select these and which services we offer for used products here. In March 2008, we began the process of switching entirely to green electricity for our power supply. Alongside reducing our energy consumption, we are focusing on using renewable energy, which we generate by using photovoltaic systems installed at our sites in Idstein and Neu-Wulmstorf. We have redeveloped our campus and converted an area into a colourful meadow of wild flowers. There are insect hotels, nesting and breeding aids, as well as bird baths in the company grounds. Together with the “Blühendes Idstein” work group, we have planted the ballast bed on the roundabout in front of the company campus with greenery. Native plants now offer sustenance for bees, bumble bees, butterflies and moths and enrich the city’s image with another colourful habitat. Furthermore, we set great store in the fact that no herbicides are used on flowerbeds or lawns and only bioorganic fertilizers are used. We act as sustainably as possible with regard to mobility. For our employees, this means that for business trips within Germany and bordering countries, travel should be by rail.Furthermore, we try to avoid air travel wherever it makes sense with the aid of our video conferencing systems. In 2014, our employees covered just under 4,000 km of their commutes by bike as part of the “Mit dem Rad zur Arbeit” (Go by bike to work) initiative from the AOK health insurer. This saved 400 kg of CO2 and burned over 49,000 calories. Our 2011/2012 Environmental Report outlines our many years of commitment to ensuring environmentally responsible operations. It describes in detail what we’ve achieved to date and which goals we’ve set ourselves. We have been a bluesign® system partner since October 2011. Thanks to the bluesign® system, we can guarantee the sustainable production of textiles. bluesign® eradicates environmentally unfriendly and health-damaging substances from the manufacturing process, right from the start. All stages of the process are fully monitored by an independent auditor in order to guarantee environmentally friendly and safe production, as well as compliance with the strictest consumer protection requirements. Our goal is to obtain all of our fabrics and 75% of our components (such as buttons, zips, drawcords, etc.) from bluesign®-certified manufacturers from 2020 onwards. 02/2015 – We are able to ensure that 63% of our appointed material manufacturers (fabrics and components) have not used hazardous chemicals, including all preliminary stages. 14% of our material suppliers are currently undergoing the bluesign® screening or implementation phase. 02/2016 – Two-thirds of apparel fabrics used in our 2016 summer collection are bluesign® approved and meet the highest standards with regard to an effective use of resources, consumer protection, water and air emissions as well as workplace safety. MRSL stands for Manufacturing Restricted Substances List and refers to a list of chemicals which should not be used or may only be used in limited quantities as they can be harmful to humans or the environment above a certain concentration. We have developed a uniform MRSL with the Zero Discharge of Hazardous Chemicals group (ZDHC) in order to have the greatest possible influence on our suppliers of fabrics and components, with the full weight of the market power of the companies in the ZDHC behind us. Our requirements for hazardous substances have been summarised in the GreenBook since 2007. All manufacturers, irrespective of whether they supply finished items of apparel, materials or components, must comply with these requirements. The minimum requirements listed in our GreenBook are based on both worldwide legal requirements, such as REACH, as well as the those of the bluesign® standard and the Oeko-Tex® Standard 100.In order to ensure that the requirements are adhered to, we have outlined a comprehensive test programme to be carried out by independent accredited laboratories in Germany. PFCs (perfluorinated and polyfluorinated compounds) make the outer material of jackets and trousers resistant to water, dirt and oil. The problem is that some chemicals in this group are already known to be toxic (poisonous), persistent (non-degradable) or bioaccumulative (they accumulate in organisms). As the information available is not conclusive, we would rather err on the side of caution than have to later live with the knowledge that we have damaged people or our planet. We therefore decided in 2012 to eliminate all PFCs from our products by 2020. In 2009 we had already begun to ban PFOA – a substance that belongs to the PFC group and which was not yet legally regulated but was already regarded critically – from our products. The switch to PFC-free, water-repellent coatings is in full swing. In order to find straightforward and proven non-critical water-repellent coatings for our products, this topic has become an important issue in our innovation department. 02/2016 – 77% of our apparel products for the 2016 summer collection are already PFC-free. This means that we have reached this target two years ahead of schedule. 02/2017 – 89 % of our clothing products in the 2017 summer collection is PFC-free. The amount of recycled contents in our products is more and more increasing. In order to ensure transparency regarding the origin, all recycled materials are certified according to the Global Recycled Standard (GRS). To guarantee a compliance with thresholds for harmful substances, we are already using bluesign® approved recycled materials for the very most part. It is our goal to exclusively use bluesign® approved recycled materials from 2020 on. Mircoplastic in the oceans is more and more increasing. Mircoplastic, those are merest plastic particles that accumulate in our environment and may harm ecosystems and human beings. 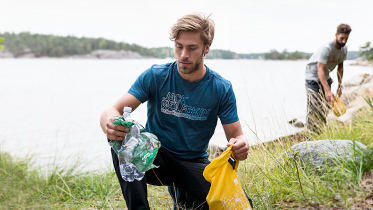 Garments are considered to be one of the sources of microplastic due to the regular washing into washing machines where microfibers are washed out each time. We are fully aware about that problem and decided to find answers for the most pressing questions about microfibers and to define specific options for action. We want to find solutions not only for us as company, but also for the entire outdoor industry and within global contexts. We were the first company in the industry to have joined the Zero Discharge of Hazardous Chemicals (ZDHC) programme in 2012. The aim of this group of globally active clothing companies is to ban all dangerous chemicals from the entire production chain by 2020. This ambitious aim can only be achieved by working together with the industry, supervisory authorities and stakeholders. We’re doing everything we can to achieve this aim. At the end of 2016 the ZDHC published a jointly developed and industry-first Wastewater Guideline – with regard to our regular wastewater tests, we are following this guideline in order to achieve zero discharge in the industry together. Our incoming freight accounts for the majority (approx. 73%) of our total CO2 emissions. As part of the drive to restructure our procurement processes, we changed our entire production and supply cycle and introduced binding ecological criteria for our global freight transport with regard to the means of transport selected and route planning. The main aims have always been to replace as much air freight as possible with sea freight and to optimise all transport routes, including pre- and post-transport. We don’t have anything to hide – that’s why we decided in 2014 to publish not only our direct suppliers, but also show the upstream steps transparently on our website. For clarity, the suppliers have been divided into three categories: pioneers, good suppliers with potential for improvement and suppliers who are still in the early stages. This makes it possible to identify developments and make our bluesign® goals understandable and measurable. We offer our trainees interesting tasks where they become familiar with a number of occupational perspectives. In addition, they have the opportunity to get a taster of interesting departments, both at our headquarters in Idstein and at our European central warehouse in Hamburg. We offer our employees crèche and nursery places at the Idstein Kinderwelt day care centre. We supply the day nursery with outdoor apparel and equipment such as jackets, trousers and backpacks so that the kids can have a day in the woods each week whilst being protected from the elements. We offer our team a comprehensive sport programme with something for everyone, to balance out stressful, fast-paced working days. Alongside activities such as yoga, back training, badminton, basketball or football, which take place in the company’s own sports hall, there are also other sporting activities to choose from, such as climbing or swimming. But the special highlight remains the time we spend together outdoors. Orienteering, mountain biking, climbing, skiing, hiking and yoga weekends all strengthen the sense of team spirit in the great outdoors. We don’t need a statutory quota for women in the workplace! Even without a quota, we have an above-average proportion of women at all levels. A woman has been at the helm of Jack Wolfskin since 2014. In total, just under 60% of the employees at our headquarters in Idstein and our European central warehouse in Neu-Wulmstorf are women. Just under a third – 32% – of the managerial positions are held by women. We have held the Wolf’s Cup since 2005, alternating between Idstein and Neu-Wulmstorf. Participants are company teams from the area. The companies pay a certain amount for each goal scored or pay a sign-up fee in order to take part. Furthermore, there is a range of supporting events for young and old alike. The proceeds are donated to a different charitable foundation each year. We have been supporting Vitos Behindertenhilfe für Kinder und Jugendliche Idstein since 2014. At Vitos Behindertenhilfe, children aged six and older and teens with learning and mental disabilities receive a new purpose in life in residential groups, as well as professional development support. The goal is to allow them to be in charge of their own lives as far as possible. This involves the development of social skills, enjoyment from doing activities together and the initiation and fostering of abilities and talents. 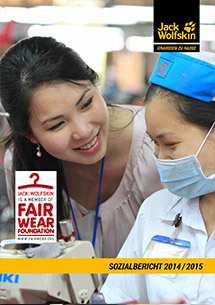 We have been a member of Fair Wear Foundation (FWF) since July 2010. FWF is a multi-stakeholder initiative, which, together with its members, pursues the goal of securing humane, fair and safe working conditions in textile production. FWF only works with companies who wish to take over the responsibility for their supply chain and supports them with expert advice, stakeholder dialogue and a training programme that benefits our manufacturers. Furthermore, FWF audits the business practices of its members and the implementation of fair working conditions amongst our manufacturers annually. As a multi-stakeholder organisation, FWF provides a transparent report on the results. We do not operate any of our own factories. Our products are produced by partners who are primarily located in Asia but in parts of Europe too. By establishing our Code of Conduct in 2007, which is based on the UN and ILO (International Labour Organisation) Conventions, we’re able to monitor our products and ensure compliance with social standards as far as possible. The employees who manufacture our products day after day in particular should benefit from our efforts. They need to be aware of their rights if they’re going to demand them, which is why we have had the Code of Conduct translated into all the languages of the countries in which our production facilities are located. It is displayed at production sites, so that it is visible to the workers. Compliance with the Code of Conduct is checked by means of regular, independent audits in conjunction with training sessions. We also have an entire team working in order to continually promote compliance with social standards for the suppliers and consistently improve working conditions at production facilities. 10/2011 – 100% of suppliers are regularly audited by independent auditors. Fair Wear Foundation carries out verification audits . As a member of Fair Wear Foundation, we publish a comprehensive report annually, in which we describe detailed information about the degree of progress in implementing social standards at our production sites. We do not mince our words in doing so, and publish both our successes and challenges, which are part and parcel of being involved in a global supply chain. The report also contains information about our production countries, background reports from the audit and many interesting details. Have you read our last report? It’s well worth it. We would like to have your trust, and the best way to get that is with honesty. We have therefore decided to publish the results of our social audit, as well as further information and images of the factories in which Jack Wolfskin products are made, on our website. It’s not yet perfect, and some suppliers still have some way to go before all social standards have been implemented. Nevertheless, we wish to pursue this path with our partners and support them in bringing in fair wages, safe working conditions and flexible working hours. We use down as a lightweigt, comfortable filling material for apparel and sleeping bags. The proportion of down products in our collection is relatively low as a whole.We have adopted a policy forbidding the use of feather down taken from live animals and birds farmed for foie gras. All the down we use is reviewed by the “Responsible Down Standard” (RDS), which is part of the Textile Exchange organisation, to ensure strict adherence to this requirement. The strict exclusion of feather down taken from live animals and birds farmed for foie gras is a major concern for us. We are therefore in close contact with animal protection organisations such as Vier Pfoten in Germany (Four Paws) and are actively involved in a multi-stakeholder working group for sustainable down production. Jack Wolfskin does not use real fur. We do not consider it morally justifiable to breed animals just for their fur, or to use furs for fashion purposes. We are a member of the Fur Free Retailer Program, which is coordinated in Germany by the animal welfare organisation Vier Pfoten. All of our fur trims are made exclusively from high-quality faux fur. Leather is an important primary material for footwear, and we use high-quality leather for our products. When we select leather, we make sure it does not come from protected species and that it is a by-product of the meat industry. In particular, we have defined very strict standards for the use of hazardous chemicals in the tanning process for the leather we use. Merino wool is a great raw material for the outdoor industry, which can be used for underwear or socks. However, mulesing is not an option for us! Mulesing is a procedure still used on Merino sheep in many countries and describes the removal of the skin folds on the animal’s buttocks. The procedure is generally done in the first year of the animal’s life and without anaesthetic, making it very painful for them. It is used to prevent flystrike and other diseases in sheep caused by insects that can nest in the sheep’s thick wool. This practice is on the decline now, but is still common in Australia, for example. 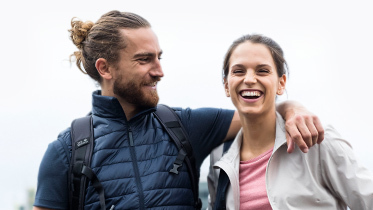 Jack Wolfskin wants to distance itself from this practice and uses certification to ensure that all of its Merino wool is obtained without the use of mulesing. Angora rabbits are often not treated appropriately. It can also not be ensured that the animals are not subjected to any suffering when the wool is extracted. For this reason we have decided not to use angora wool. We have been using cotton exclusively from certified organic sources for all products containing cotton and cotton blends since our summer 2013 collection. The cultivation of organic cotton is subject to high environmental standards. For example, the use of chemical fertilisers and pesticides is prohibited, as is the use of genetically modified seeds. This benefits the environment in the region of cultivation, as well as the cotton farmers, who are no longer exposed to hazardous chemicals during their work. We use recycled polyester in some of our products. In order to ensure transparency regarding the origin and compliance with thresholds for harmful substances, we use exclusively bluesign®-certified recycled materials. 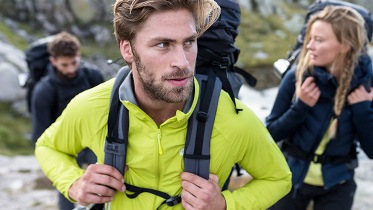 Jack Wolfskin has not used nanotechnologies since its winter 2010 collection. The reason behind this is that there have not yet been any definitive long-term studies into their effects on the human body that could explicitly exclude any possible risks. As a precautionary measure and out of respect for nature, our customers and our employees, we will wait for reliable results from studies before we make any decisions on the use of nanoparticles in our collection. We continued to reduce all PVC elements in our entire collection (apparel, footwear and equipment) until the end of 2011 and we have stopped using it completely since April 2012, in line with the principles in our GreenBook. The supposed advantage of PVC – its durability – is also the crucial disadvantage. The material is extremely robust and barely decomposes. If PVC is burned, it creates corrosive, gaseous hydrogen chloride, which forms hydrochloric acid when combined with water or atmospheric humidity. As PVC can be replaced by more environmentally friendly materials, we have decided to take this opportunity and no longer use any PVC. All of our products for kids comply with the German standard (DIN EN 14682) for drawcords and straps on kids’ clothing. In the design phase, we make great efforts to design apparel that is not only comfortable, simple and easy to wear, but which also complies with the highest safety standards. Our designers and technicians therefore ensure that small parts such as buttons or zip sliders cannot come loose and be swallowed and that drawcords are attached in a way that they do not pose a danger of strangulation. Products that come into contact with food in particular – such as our vacuum flasks and aluminium bottles, cups and drinks bladders – undergo comprehensive tests before we put them on the market. The safety of our products has top priority. Make your clothing weatherproof again with our 100% PFC-free, environmentally friendly waterproofing service! The right care renews the functional properties of your weatherproof clothing and makes it last longer. With our professional waterproofing service, we offer you optimum care for your TEXAPORE functional apparel. Your items will be washed and impregnated in an environmentally friendly way so that they become fully functional once again and are ready for more great outdoor experiences. The life cycle of your weatherproof apparel can be significantly prolonged thanks to professional rewaterproofing. Help us to be even more sustainable! With our professional repair service, we can restore products, including patching up small holes to make them waterproof again. In order to take advantage of the repair service, please bring the faulty product to one of our stores. Our store partners will then send the item to our repair team and you will get your perfectly restored favourite item back.